The leaders of Egypt, Sudan, and Ethiopia will hold a trilateral summit in Addis Ababa on Sunday on the sidelines of the 32nd African Union Summit, state-owned MENA agency reported on Saturday. 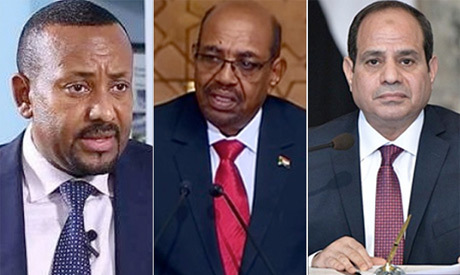 According to MENA, Egypt's President Abdel-Fattah El-Sisi, Sudanese President Omar Al-Bashir and Ethiopian Prime Minister Abiy Ahmed will discuss issues of mutual interest. It will be the first trilateral meeting between the leaders of the three countries since Ahmed became prime minister in April last year, succeeding predecessor Hailemariam Desalegn. The foreign ministers and high state officials of the three countries have met in the past year to discuss issues related to the construction of the Ethiopian Rennaisance dam. El-Sisi will officially assume the 2019 chairmanship of the AU on Sunday. The Egyptian President is also set to meet with the UN Secretary-General Antonio Guterres, who is attending the summit, and he will request more coordination and cooperation between Egypt and the UN on a number of issues. He will also meet on Saturday with the President of Democratic Republic of Congo Felix Tshisekedi.